Does the third season of the Greenleaf TV show on OWN lift your spirits? As we all know, the Nielsen ratings typically play a big role in determining whether a TV show like Greenleaf is cancelled or renewed for season four. Unfortunately, most of us do not live in Nielsen households. Because many viewers feel frustration when their viewing habits and opinions aren’t considered, we’d like to offer you the chance to rate all of the Greenleaf season three episodes here. An OWN megachurch drama, Greenleaf stars Keith David, Lynn Whitfield, LeToya Luckett, Lamman Rucker, Kim Hawthorne, Lovie Simone, Merle Dandridge, Desiree Ross, Deborah Joy Winans, Tye White, Rick Fox, and Oprah Winfrey. Season three guest stars include Patti LaBelle, Beau Bridges, and Iyanla Vanzant. The story centers on the Greenleaf family and their Memphis congregation. The third season kicks off in the wake of revelations about the Bishop’s (David) infidelities. What do you think? Which season three episodes of the Greenleaf TV series do you rate as wonderful, terrible, or somewhere between? Should OWN cancel or renew Greenleaf for a fourth season? Don’t forget to vote, and share your thoughts, below. 9/19/18 update: OWN has renewed Greenleaf for a fourth season. Details here. 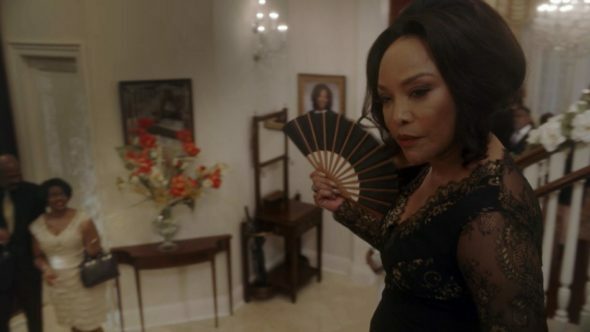 More about: Greenleaf, Greenleaf: canceled or renewed? I love the show and I would be sadly disappointed to see it end..Kudos to OWN for granting its continuance..I can’t wait for Season 4 and beyond..
Love Greenleaf. So many are addicted to this show including me. If they cancel this show….”I can’t even” as Lady Mae would say. I suspect and expect to see Season 4, 5 and 6 renewed. I love everything about this show. Hope you do not cancel. I like Greenleaf but disappointed that they have brought Rick Fox back as a regular. He lacks chemistry with Merle Dandridge one of the main characters and that takes me out of her story. I hope they bring in a new love interest to better compliment her. The other stories are good. Curious about Lady Mae and her secrets. I have not seen it fully yet. I live in Canada so I haven’t seen the start of Season 3 yet. Darn!